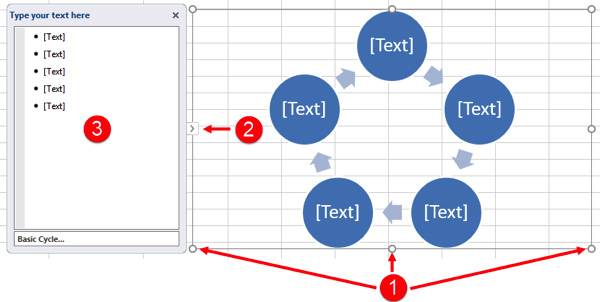 In this article, will delve a little deeper into how to incorporate SmartArt in Microsoft Excel. SmartArt combines text-based information with graphics to create a more appearance-driven look. Using Excel’s tools, you will be able to create great SmartArt that can be used for a variety of different purposes. Over the course of this topic, you will learn how to insert SmartArt into your workbooks, as well as customize it after it has been inserted. 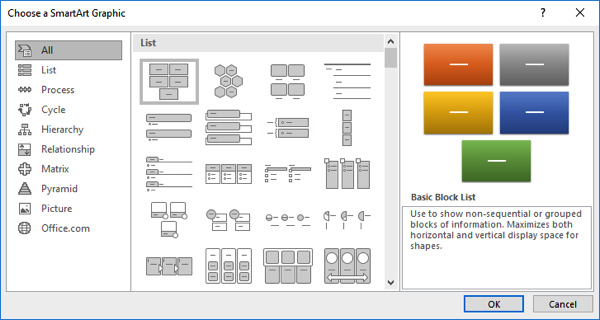 The Choose a SmartArt Graphic dialog box is divided into several categories of graphics, each of which is displayed in a panel on the left. Here is an overview of each of these categories. The Matrix category is used to show how elements in a system relate to it. By clicking on these categories, you will change what type of SmartArt layouts are displayed in the middle pane. Clicking the thumbnail for a SmartArt graphic will display a preview for that graphic as well as a brief description for it. With the thumbnail still selected, click OK to insert this graphic. Using this pane you are able to enter text into the SmartArt graphic. While you are still able to enter text directly into the graphic by clicking on the placeholder text and typing over it, the Text pane offers broader control over it.